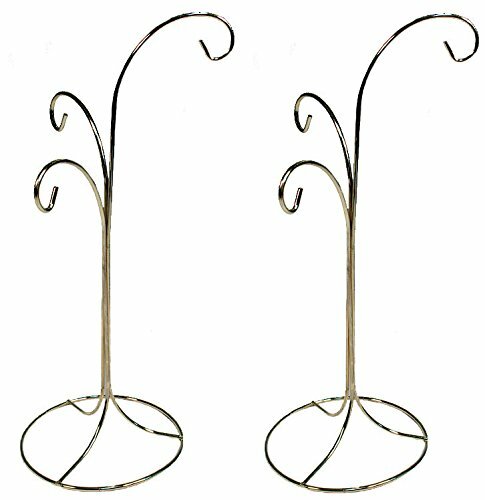 Creative Hobbies Ornament Display Stand Holder Hanger Has 3 Hooks, 13" Tall -Pack of 2 Stands. Gracefully curved stands to display your favorite ornaments! Use these attractive Bright Brass plated display stands to showcase your favorite ornaments, glass suncatchers and trinkets! This lot is for 2 stands, each is 13 inches tall overall and features three sturdy hanging hooks placed at 11.5" high, 9.5" high and 8" high so the ornaments hang at various heights. This stand has a 5" round base and bright gold tone finish. Simply hang your favorite ornaments on the stands and proudly display! Creative Hobbies Ornament Display Stand Holder Hanger Has 3 Hooks, 13" Tall -Pack of 2 Stands. Gracefully curved stands to display your favorite ornaments! Use these attractive Bright Brass plated display stands to showcase your favorite ornaments, glass suncatchers and trinkets! hanging hooks placed at 11.5" high, 9.5" high and 8" high so the ornaments hang at various heights. These stands have a 5" round base and bright gold tone finish. If you have any questions about this product by Creative Hobbies, contact us by completing and submitting the form below. If you are looking for a specif part number, please include it with your message. Clear Acrylic W/gold Wire Ornament Hooks 24pc.